The internationally well- know 27 holes golf course les Dunes gives you three outstanding 9 holes (par 36) which delight golfers of all levels. 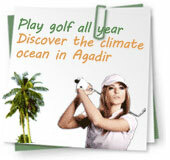 It benefits from Agadir oceanic climate, which enable you to play all year long. The area gets more than 340 days of sunshine a year, with temperature between 15° and 25° during the day and in summer an oceanic mist in the morning or in late afternoon keeps the temperature between 22° and 28°. The region can occasionally experienced temperatures around 35° when there are hot and strong winds coming from the sahara but it never lasts long. The golf course les Dûnes happens to be during summer one of the few golfic destination in Morocco. 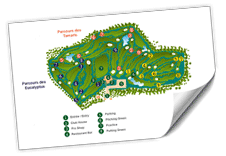 However your level may be, a caddy is expecting you and will introduce you to the 9 or 18 holes chosen. You will find at your disposal rental facilities including buggy hire and clubs hire. 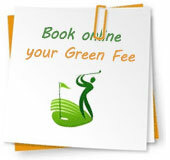 You don't need to be the owner of a green card to book a green-fee, after a few sessions at our practice you may achieve your first course under the advices of your experienced caddy.